Using powerful interlocking magnets for effortless attachment, these extenders add extra length to necklaces, bracelets, or anklets—making them simple to put on and take off! Set includes 2" long and 4" long extensions that work with most jewelry clasps. Goldtone or Silvertone. Set of 2. Extentension to stone necklace permitted it to be worn well with sweater. Friend liked that necklace then became more versatile. I bought this for my mother-in-law who was having difficulty fastening a tiny clasp on a necklace. She loves it and now she can wear her earrings AND the matching necklace. I purchased the magnetic necklace extenders as I already used them on some new necklaces that I wanted to extend in length so they are a now a good length with the silver extenders on them. When the fingers lose a little dexterity and strength, these magnetic closures are a life saver! The necklace extenders work well and it's easy to put on my necklaces with the magnetic clasps! I ordered these for my mother-in-law because she couldn't fashen her necklaces any longer, and my father- in-laws hands were too big to fashen them. She just loves the magnetic extenders. The shape does not distract from the actual necklace. It blends in with the other chain. Sturdy magnet so feels secure. Would have liked to have the option to get two of the same length instead of one of two different lengths. This is the perfect solution for all of us who have trouble hooking those small clasps on necklaces. I will be ordering more for my Mom and friends. Exactly what I was looking for at a great price!! Perfect for my necklaces that are hard to fasten. Quick and easy. I don't have to turn back of necklace to front to fasten. IT IS JUST AS GOOD AS DESCRIBED AND VERY EASY TO USE. Love these things. I've had a stroke and it is a God send. I'd bought a few pendants on[...] and needed some necklaces to hang them on. My fiance bought short chokers when I'd envisioned 18" necklaces. Your extenders made them a useable length. Plus, I'd been having great difficulty fastening necklaces myself (had to ask kids or fiance to do it) but these magnetic ones are easy. One of the best things I've ever bought myself. The magnetic clasps/necklace extenders work wonders... I've been looking for more of this particular item and glad I found these at a great price. Thanks so much. would buy this again and again. easy to put on necklaces. Like to combine 1 short & 1 longer pcs to make an extension the exact length I need, so necklace hangs "just right". 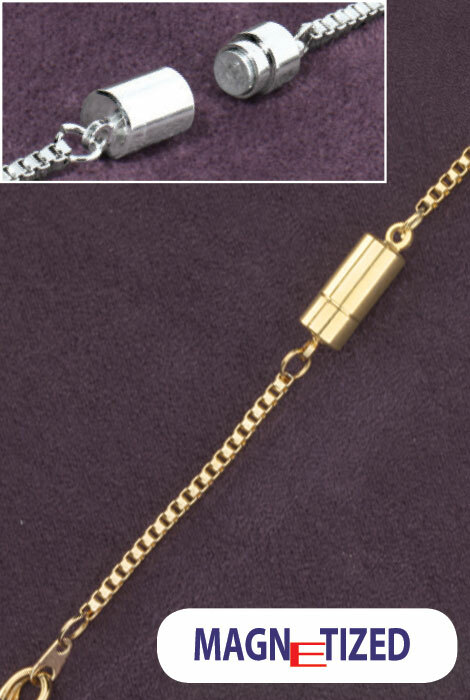 These are ESSENTIAL for my "best" pcs as the gemstones ALWAYS come on very fine chains with very tiny clasps! 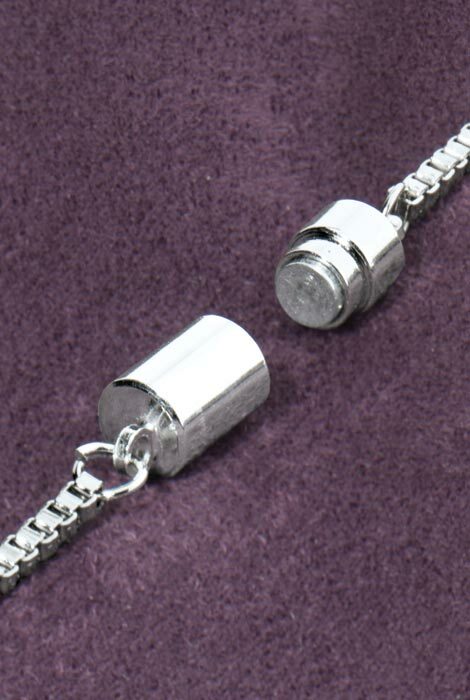 My husband ENJOYS fastening (and removing) my necklaces for me when they have these magnetic clasps on them. The round locking magnets are very secure and much easier to use than other designs I've tried. Whenever I give jewelry, I include a set of these clasps with the gift - they're always appreciated! Being able to match gold and silver finishes is wonderful! The Best Thing Since Sliced Bread!! LOL!!! I absolutely LOVE these magnetic necklace extenders!! The two sizes are perfect to make the necklace as long or short as you want!! Who ever thought to make these, are genius!! I also buy the magnetic closures for all my necklaces and bracelets. They make it so very, very, easy to put your jewelry on!! If I buy a necklace or bracelet for a gift, I always include all of these and they make the gift more special and the person receiving the gift always thank me and ask "where did you get these"? Miles Kimball, of course!! Love this product. It makes putting on a necklace easy for those of us that have arthritis in our hands and fingers. I have magnetics that I bought from a retailer; but cannot find the longer "add-ons" of 3 or 4 inches. makes putting on necklaces easier for my arthritic hands. thank you! This item makes it easy to put on your necklaces without help from others. I really needed this type of magnetic necklace extenders ... these work wonders and very pleased with the look to my other necklaces. Thanks so much. These are a great way to make necklaces exactly the right size. they also make clasping and taking off the piece much easier. I have a bad shoulder and it is very difficult to put on a necklace. This item is so easy to use and I can now wear any of my necklaces with out help to put on. Love the different lengths for different necklines. This has worked well for the necklace I orginally bought this for, however when I used it on another lighter necklace I noticed I kept having to pull the necklace back down as it would fall down my back. I guess the magnet was a little heavy for that necklace. It is so much easier to put on my necklaces and braclets now without so much trouble. These are wonderful! well worth the purchase. I used this to lengthen a 16" necklace. 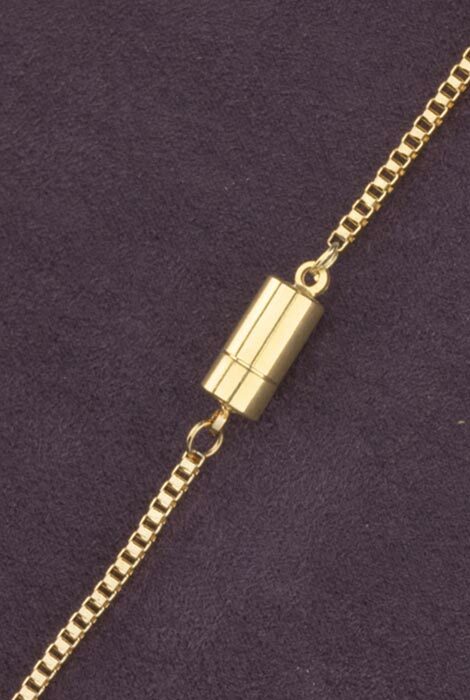 These magnetic clasps are simply great however usually the weight is heavier than the chain they are attached too so they don't stay in back of the neck but slide down to front. I wish they could be made light weight but still durable. THEY WORK GREAT. TO BAD THEY TARNISH. Purchased as a gift. How embarrassing and maddening that three of the extenders wouldn't open at all, and the fourth opened only slightly - not wide enough to attach a link. I was influenced by the two or three glowing comments, which I now suspect were just plants. This was my first and last purchase from this company. The magnetic barrel came off the cheap metal ring holding it to the chain, right as I took them from the package. Disappointing. These could have been a convenient solution. The lengths were very good, but the color was more gunmetal than silver tone. It made no difference in the long run, though, since one arrived broken and the other broke within one week of use. I emailed the Customer Service address on the website, but did not hear back. Decided that cost of shipping was not worth the return. Needless to say, I'm disappointed. I only ordered two necklace extenders and particularly needed the four inch one. The four inch extender had come apart from its change and was useless. The two inch extender works but is a little short for what we needed. We will find an other place to buy extenders and purchase one. One of the extenders was in 4pieces instead of being put together, so unless I can figure out how to put it back together I will not be able to use it. Used it once and broke that same day! and the magnet would not detach and broke the connector rendering it useless. The chain fell apart on the first time I wore it on a necklace. It lasted less than 2 hours! I liked the magnetic feature, however after one use I awoke to find that the magnet held but the clasp to the necklace broke on the extender itself. Sorry, I cannot recommend this product. On each extender one chain isn't hooked to the clasp, therefore they are not usable. Ordered 2 pkgs (2 ea.). One arrived broken; two broke on first use. Afraid to rely on the last one for fear of losing an expensive necklace. Don't bother ordering item. Very poorly made. Fell apart upon opening. Lobster clasps did not open - a complete waste of money. I ordered these magnetic jewelry clasps for my necklaces as I have arthritis and find these help me be able to wear my necklaces. The last type of magnetic clasps for my jewelry that I also purchased from Walter Drake were much better quality; these seem more flimsy and one of the gold clasps came in broken pieces. One of these was broken when I opened it, and the other broke when I tried to put it on one of my chains. Unfortunately, I bought several sets of these magnets and all of them failed after the first use. They pulled away from the rings attaching them to the magnet or attached them to the clasp. Very poor workmanship. It was a wast of money. I needed to make my necklace that I wear my I.D. longer, and room key, so that I can use it easier to open my classroom door. Chain design looks better than others. This solves two problems for me. lengthening of necklaces and ease of use with Neuropathy in my hands. I am tired of lobster clasps because they have become too cumbersome to use. They are difficult to use because my nails are too long to properly grasp both ends on thinner chains. In addition, as I am getting older, overall, I find the lobster clasp is becoming more difficult to use on chains of all thicknesses. need extensions for some necklaces. hope they are a decent quality. To make necklaces easier to put on and make them longer. Need some magnetic attachments for my necklaces. Fingers don't work well any more. Saw negative review and am hoping it was a fluke. Have bought similar Magnet extenders on all of my jewelry that does not fit over my head and I love the fact that I can wear what I want when I want to wear it and don't have to depend on an extra set of hands to come home and fix me up. Without it, it is too frustrating and I wind up wearing nothing on my neck. I have a hard time closing short necklaces and these were at an excellent price. i can no longer stand lobster and oring clasps that hurt my fingers. At my age I am taking a stand on this issue and I simply will not tolerate it any more...(! such a problem in western society I know but still, if my fingers hurt, I don't want that) so I am looking for other solutions jewelry makers please take note, develop easier clasping mechanisms for the sake of God. Do these magnetic closures twist afterr the magnet closes? BEST ANSWER: No. They work really well!